Widely regarded as London’s top parenting expert, Ann Herreboudt has 25 years’ experience as a midwife, fertility expert, child psychologist, family therapist, first aid teacher, aromatherapist, breastfeeding consultant, antenatal advisor, doula trainer. This September 2013, Ann qualified as a Psychoanalytic Parent Infant Psychotherapist. She ran one of the world’s longest ongoing postnatal support groups for parents, toddlers and babies in North London for 21 years. Ann has spent years working alongside renowned consultant obstetrician and gyneacologist Yehudi Gordon at his Viveka clinic and the famous John and Lizzie's birth unit in St John's Wood. She is also based at the Women’s Wellness Centre in Chelsea run by obgyn Gubby Aiyeda . There she provides one to one support to patients in areas ranging from psychotherapy and practical parenting to birth preparation and post-natal support. Her sessions cover birth trauma, breastfeeding and depression. Ann is recognised by some of the most accomplished practitioners in the world of obstetrics and fertility. As a parenting guru, she advises parents on colic, reflux, sleep issues, weight gain issues, sibling rivalry to name but a few. 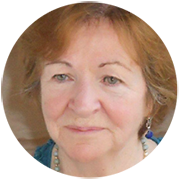 Ann is a qualified nurse and midwife, child psychologist, first aid teacher, breastfeeding counsellor, and massage therapist. Ann lives in North London and has a grown up son and daughter. Transitions in life are never easy. One of the most complex is that into motherhood, fatherhood and parenthood. Babies don’t come with a handbook, which means you have to work things out as you go along. It is difficult to understand the needs of a new baby when you cannot read the physical and emotional signs of the newborn. What’s more, there is so much information out there to cope with, it can seem like the world and its aunt are giving advice to new parents. My passion is helping parents understand the needs of their babies – to sort through the plethora of mixed feelings they have when it comes to their parenting abilities, all of which they experience while recovering from pregnancy, birth, and breast or bottle-feeding, a time of sheer exhaustion. The key to happy parenting, I believe, is in parents learning to read and understand their baby’s clues. Babies are born to communicate. However, they communicate as babies from their baby brain, which is difficult for our adult brain to interpret. My passion is in helping parents unlock the mystery of this baby world, assisting them in understanding the normal and to settle the small areas that can be confusing. This process reduces mum’s anxiety, allowing her to enjoy the wonderful and amazing moments of early mothering. As the newborn phase passes, all children develop at different paces. Some become stuck in certain developmental areas, which may have the effect of the mother also becoming stuck, not knowing how to help her child through this particular stage. Helping mother and child to find a way through this gives me great pleasure. Often, this transition happens very easily, allowing the natural rhythm of development to continue. I am also passionate about helping people understand their feelings, fears and disappointments when pregnancy does not happen when expected. Understanding all the complicated medical terms and procedures can be difficult. Having someone to talk to, who understands both the emotional and medical sides, can make treatment and investigations bearable. Finally, I also counsel people when relationships hit difficult times. During these times, parents find themselves not just dealing with their own upset and grief but having to support the children through a life-changing event. Amid the turmoil, it is crucial that they develop a good parenting structure. Although, during a divorce, the parents will have family, friends and legal advisors around them, they are more likely to struggle with trying to decide about what is best for the children and keeping their lives as normal as possible. Children respond in a variety of ways to relationship upsets; some quite acutely with anger; some taking sides; and others may even become withdrawn. I help parents to cope with their own pain and confusion, while also coping with the turmoil created within the child or children with their decision to separate.